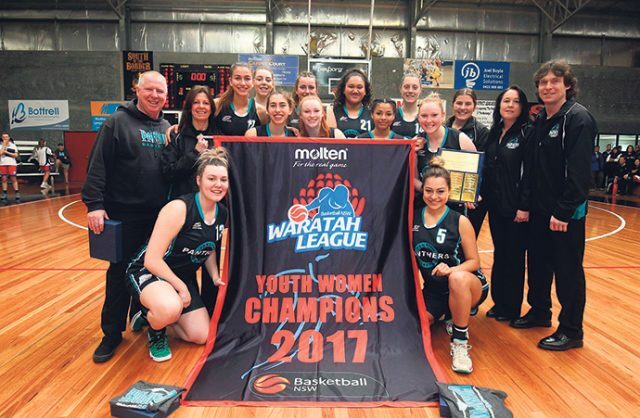 The Cleveland Cavaliers and Golden State Warriors both failed to do it in recent NBA seasons but the Penrith Panthers women’s basketball team have managed to achieve an almighty feat – winning back to back Division 1 Youth League championships. The Panthers won their second straight Youth League title after defeating minor premiers Central Coast 69-63 in last Sunday morning’s Grand Final played in Maitland. Penrith led for the majority of the 40-minute match before the Crusaders surged back to tie the game late. Fortunately the Panthers, led by popular coach Leonie Moore, used their experience and determination to regain the lead and win by six points. Speaking with the Weekender, Panthers captain Dominika Offner said it was an absolute thrill to go back to back. “It definitely took a lot of hard work and determination from the girls but I always believed we could to it,” she said. Due to age restrictions, this was the final time the savvy guard, who landed two three-pointers in the decider, was eligible to play in the Youth League competition. Offner will leave the competition with three Youth League titles under her belt and plenty of memories, especially from this season. “Each title has its special qualities but this year I got to play with my sister Teiarna and my parents were also part of the team set-up, with my dad assistant coach and my mum team manager,” she said. While last Sunday’s historic win was a spectacular team effort, talented point guard Binta Salawu was the standout performer – winning the Grand Final’s Most Valuable Player award following a 20 point outing. Offner said Salawu’s epic performance will be remembered for a long time. “Anyone who watched the game couldn’t question that Binta deserved the MVP,” she said. “Binta played awesome; she did what she needed to do and executed her job perfectly.